From wearables to audio, from smartphones to computing. 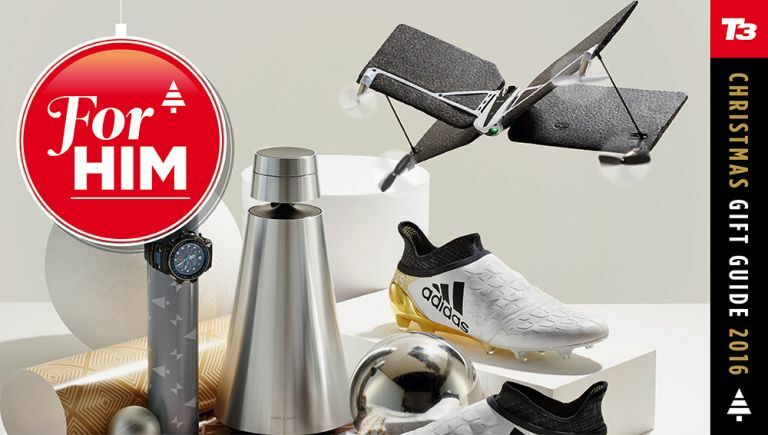 Here we've got the best tech for your boyfriend, husband, brother, any male in your life, basically, but be sure to check out T3's other gift guides to keep the whole family happy. Tough enough to withstand a Hurricane and with suitably chunky styling - the Gulf Master is designed to meet the exacting requirements of a maritime professional. The multitalented timepiece packs a barometer, digital compass, and a tide indicator to keep him safe at sea. Follow in David Beckham's footsteps with these, literally, golden boots. A culmination of Adidas' most advanced technology, the Stellar X16+ Boots ensures he creates chaos on the pitch. The lightweight SPRINTFRAME outsole provides rock solid stability, while the PURECUT sock system hides unsightly laces. Drones which fly like planes are officially more fun than traditional quadcopters. Parrot's Swing is the best of both worlds - with automatic vertical takeoff and powerful plane-like flight. The lightweight, durable craft features a super precise controller, helping him fly like a pro. It may be expensive, but this stylish Bluetooth speaker is worth it. The BeoSound 1 pumps out seriously impressive 360-degree sound, and connects to a plethora of streaming services from Spotify, to Google Cast, and Apple AirPlay. Relive childhood with this mini replica of Nintendo's classic NES. The modern revival plugs directly into your telly and comes with 30 games pre-installed. Whether it's the original Super Mario, Legend of Zelda, or Pac-Man - your kids won't believe how rubbish games used to look. When it comes to recording his extreme stunts (or epic fails) there really is no better action cam than the GoPro Hero5 Black. The newest model in GoPro's lineup now features voice control, to make operation it easier, as well as GPS and video stabilisation. HTC's flagship is the perfect smartphone for a music fan in your life. As well as the stereo BoomSound speakers, the HTC 10 also features a powerful high-res audio amp to drive premium headphones. We love the design, and the camera is great as well. If you can't afford a Porsche 911 the next best thing are these Porsche Design Kef headphones. The premium cans, finished in sandblasted titanium, feature advanced noise cancelling which doesn't affect audio quality. If he prefers Windows to Mac, Dell's XPS 13 is an excellent choice. The InfinityEdge display is spectacular, and it's one of the most portable laptops we've ever tested. There's serious power as well, with Intel's Kaby Lake processor under the hood. If you really hate your significant other, get them a fitness tracker which literally tells them how fat they are. The sleek TomTom Touch measures his body fat and muscle mass percentage with the touch of a button, as well as counting steps and monitoring sleep. This single-speed Fixie is perfect for the skinny jean-wearing, scruffy bearded hipster in your life. It's an all-purpose bike, equally at home on roads commuting, or on country trails. The Evo weighs just 10.5kg and looks amazing in either orange or midnight purple. Made from 100-percent recycled polyester and treated with a polyurethane DWR finish - we really rate this pack Patagonia. Equipped with a padded laptop sleeve which doubles as an insulated hydration reservoir when he hits the trails, it also features Human Curve shoulder straps. Forget John Boyega or Harrison Ford, the real star of The Force Awakens was BB-8. We loved Sphero's toy droid last year, and now it's back in 'Battle Worn' limited edition form. Star Wars + limited edition = early retirement fund (if he can resist not opening it). Withings' analogue timepiece now packs an optical heart rate sensor - giving him a more detailed breakdown of his workout. Easily the most attractive fitness band available and with an excellent 25-days battery life, it can even handle basic smartphone notifications. Chivas Regal has partnered with LSTN Sound Co. to create a run of limited edition bespoke headphones which have been crafted using elements of Chivas whisky casks. They look beautiful, and feature vegan leather ear pads. Perfect for the whisky and audio connoisseur in your life. The Alienware 13 is one of the best gaming laptops you can buy. The spectacular 13-inch OLED screen really brings games to life, and the powerful Intel Core i7 processor and NVIDIA GeForce GTX 965M graphics card mean this notebook is VR-ready. If you hate beards, send a hint this year with the Braun Series 9 electric shaver, now enhanced with a titanium coated trimmer. Why titanium? Because it's “as beautiful as gold, yet much harder, offering remarkable sturdiness and corrosion resistance”. Obviously. Perfect for Back To the Future fans - Swegwheel may be the closest we'll get to a levitating hoverboard in our lifetime. Essentially a skateboard with one central motorised wheel, it'll travel in the direction you lean, but be warned, it takes a lot of practise. The Motorola baby monitor comes with a wireless 'parent hub', meaning he can keep an eye on his precious little one without needing to unlock his smartphone. He'll receive instant alerts when noise, movement, or a temperature change are detected. Hey, men like to groom too! A 30 second daily cleanse with the Magnitone London will give him strong, clear and resilient skin. The Vibra-Sonic motor exfoliates 30% deeper than manual cleansing, and it's even has a turbo mode for extra oily skin. These stylish earphones from Denon are powerhouses - don't let their size fool you! The world's only Dual Driver buds with patented Double Air Compression Driver technology, using two 11.5 drivers to move more air and deliver powerful low-distortion bass. At 2-inches cubed this tiny projector is made for movie-fanatics on the go. Designed for mobile devices, the RIF6 can project a vivid, 120-inch image onto any surface. A battery life of 90 minutes will see him through most films, apart from Lord of the Rings. Nothing's nothing better than waking up to a glass of freshly pressed juice. The Duo Plus XL's large 'spin dryer' basket extracts every drop of juice from the fruit or veg, leaving the pulp virtually dry, and the new removable rim makes cleaning easier. The Olympus E-PL8 is one unbelievably stylish camera - with sleek metal curves and a classic leather grip. Performance is equally impressive, with a large Four Thirds sensor, and boasting an impressive lenses lineup to help him get beautiful selfies. Help him achieve the maximum levels of performance during a workout with these BioSkin compression shorts. What do they do? They decrease muscle vibration, which over time saves energy and prevents injuries. BioSkin's patented material is also breathable, allowing moisture to escape - keeping him comfortable. Introduce him to the world of robot building with this awesome Raspberry Pi kit. Once made the little 'bot can roam around taking pictures. There's no soldering required - the whole kit can be put together with a screwdriver and coded in whatever language you prefer. Thanks to Skepta, sportswear is all the rage at the moment. This sleek, sporty hoody is made from insulating fabric which wicks away moisture, perfect for transitioning between country trails and city streets. A 55-inch 4K television that doesn't break the bank, too good to be true, right? Wrong! This behemoth from Hisense is very impressive. With HDR in tow, impressive clarity, and a 420-nit brightness it's proof you don't need to spend thousands for decent picture quality. A Dremel may be the ultimate multi-tool, capable of decorating a jewellery box, fixing a door hinge, or, if you're brave, getting rid of tooth decay. The Dremel 5 Star Kit is incredibly versatile - complete with 5 attachments, 75 accessories, and a high-quality aluminium case. Nike's futuristic LunarGlide running shoes are designed to help him continue training in all-weather conditions. The engineered mesh upper features a durable, water-repellent coating, and the updated pattern on the sole aids grip on wet surfaces. Run Forrest, run. If you think the PS4 is too cheap and plasticy (maybe it doesn't fit in with your living room furniture?) Toast are here to help. Wrap your console in real wood veneer, expertly cut to have a matching grain and create a seamless, classic aesthetic. This no-nonsense machine takes mixing ingredients to the next level. Ensure he achieves the best possible baking results thanks to the high-powered 1100W motor, and precise speed controls. Sensors detect heavy loads, and knead dough adapting to the texture automatically. Bake Off here he comes. Perfect if your partner is trying to quit smoking (and replace it with another habit) this is one of the smallest and sleekest vapes we've seen. It's incredibly inconspicuous, and comes in a number of colours. Gillette, the best a Sith Lord can get. If your loved one adores everything Star Wars, he'll love this Rogue One branded razor. It's Gillette's most advanced razor ever, using the same technology found inside a Jedi's lightsaber to achieve the closest shave possible.